Can you remember the last time you were given a blank piece of paper and told to ‘write a story’ or ‘draw a picture’? It can be an unpleasant experience, especially when your brain refuses to cooperate, but it’s part of daily life for school children. Some decide this means they hate writing or loathe drawing. But it doesn’t have to be this way. Here's an introduction to a series of four Book Trust videos about making comics, which can be used as an school classroom lesson (ages 8+), or just for fun at home. Children naturally connect with making comics. There’s something about the combination of drawing and writing that pulls them through the process of creating a story, and it’s more fun than trying to fill a page with writing alone. In making a four-panel comic we can explore the basics of story structure, characterisation, plot, motivation and dialogue. And comics are a great medium for engaging kids who have a diverse range of skills and needs. If a child’s drawing isn’t all that great, he or she can enhance basic stick figures with clever writing and it will still tell a story. If children can hardly write a word of English, they can tell a story in pictures, and get help when they decide they need a sound effect here or there. Reluctant writers are likely to enjoy the energetic nature of comics and the freedom that speech and thought bubbles provide. In a workshop film I’ve produced for children’s reading charity, Book Trust (available free online here), I start with a little tutorial on how to draw a Sea Monkey, a funny, incidental character in Oliver and the Seawigs, my illustrated chapter book with Philip Reeve. If the children have read the book, they’ll enjoy seeing one of its characters going on to have further adventures. (And even if they haven’t read the book, it’s still fun to draw Sea Monkeys.) How often have you finished a great book and wished you could keep following the characters, even though the story has ended? In the first of the four videos, I walk the class through the process of creating a character they feel is their own. The kids can decide its name, how it will look, which kind of cheese it prefers, how it brushes its hair / scales / fur. It’s like having a new friend, or a beloved pet. They warm to it, and it looks back at them from the page. I used to think that step-by-step drawing lessons would stunt creativity by making kids think it’s the only way to draw something, but I’ve been surprised to discover the reverse is true: when people learn how to put together simple shapes and come up with an engaging character, it gives them some basic building blocks and the confidence to tailor those shapes into countless other character drawings. Add a moustache, a hat, give it bushy eyebrows, a tutu… suddenly their little creature looks very different. After the children have created their characters, in Video 2, I give them tips for making effective comics. In Video 3, we have a ‘Comic Jam’ session where the class participates in a story-making game. I lead the class through dividing their paper into four comic panels, and then start them off drawing the first of these. After five minutes, I’ll have the children swap papers and each child will begin working on someone else’s comic for another five minutes. Three swaps and 20 minutes later, each child will have a finished four-panel comic, which is then returned to the original author so they can see what kind of adventure their character has been on. The children learn that their storytelling has to be comprehensible to another person. If they get someone else’s comic and find it’s not clear what’s happening, they begin to comprehend what it’s like when their own stories aren’t clearly told. They realise that what they see in their heads has to go onto the paper, or others will struggle to understand. And they see the importance of writing legibly. Writing comics is a good practice in storytelling: children have to think ‘in this situation, what might happen next?’; random events aren’t as funny or interesting as events that have some sort of logical progression. They learn about the importance of creating a setting for their characters. A comic jam helps pace the lesson. If each child created his or her own comic, you’d have some children finishing in three minutes while others would still be working on the first panel at the end of the session. The game helps slow down children who work too quickly (“Now think, what else could you put in that scene?”) and speeds up children who might be so precious about their work that they never finish. A comic jam is more about communicating than making perfect artwork. Because multiple authors are working on the same comic, children see how stories can take different turns. The sequences might be action-packed or slow and reflective. They might be funny, sad, or very ordinary. There’s no set way to tell a story, and comics help children to understand this. By taking on a character someone else has created, pupils are also forced to empathise. The children get a chance to reflect on what they’ve created. If they like the way their story has turned out, they can use it as inspiration for making more comics in a similar vein. If they hate what happened to their character they may feel indignant. But even that negative feeling can be inspiring; they can now go and create the story they envisioned – the ‘wrong’ ending having shown them the way forward. Young comic publishers Jordan Vigay and Jonny Toons at work on a Comic Jam at the annual Thought Bubble comics festival in Leeds. 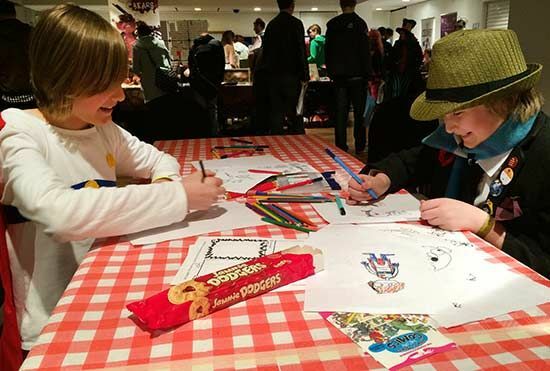 These comics festivals - The Lakes Comic Art Festival in Kendal is also fab - can be a great place to bring kids where they can mix with creators and see the comics they've made, sometimes self-publishing with only the use of a photocopier. Consider inviting a creator to your school for an Author Visit. Or getting your kids to host their own comics-selling table at a festival! Finally in Video 4, children can sing along with a Sea Monkey sea shanty. Ending with a song gives a fun, noisy finale to a focused story session, but it also shows children that their characters don’t have to stay on paper. Stories can find life in many different forms – songs, animations, puppets, and theatre – any of which may be less daunting to children than the blank white page. A note about participants with autism: empathising with someone else’s character may be hard for them, and they may balk at having to relinquish their work to someone else. In some cases, it might be better for this person to work on his or her own comic without exchanging, keeping the same panel-by-panel pace as the other people in the room. Age appropriateness: Some children under 8 will be able to make comics (particularly with one-on-one adult help) but I've found that as a group, children under the age of 8 struggle to have enough literacy to make their work understandable to each other without explanation. Many also get upset when they have to swap papers, seeing someone else drawing on 'their' paper. While younger children will enjoy learning how to draw the Sea Monkey in Video 1 and singing the song in Video 4, I recommend sticking to ages 8+ for the Comic Jam in Videos 2 & 3. 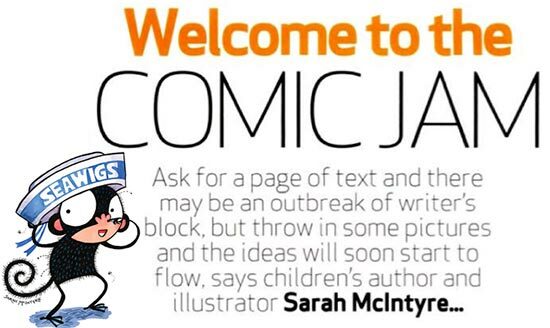 Find out more about Book Trust’s primary writing project The Write Book – and access the four videos of Sarah’s Comics Jam film workshop in the classroom here on the Book Trust website. I also created a picture book that started out as a Comic Jam with my friend David O'Connell! It's called Jampires and you can read more Comic Jam tips over at jampires.com. My comics include Vern and Lettuce, and the Shark & Unicorn strip in The Funday Times. Find lots of tips on my FAQ page and follow me on Twitter: @jabberworks You can also follow Book Trust on Twitter (@Booktrust), the director of the videos, Anna McKerrow (@AnnaMcKerrow), and Harriet Jackson (@HarrietJax), who commissioned the original article for @Teach Primary.